An examination of the then newly emerging anti-capitalist movement in the aftermath of "The battle of Seattle". Seattle succeeded beyond the wildest dreams of its organizers. The tens of thousands of demonstrators, in an admittedly heterogeneous crowd, actually succeeded in shutting down a meeting of the World Trade Organization. In the months after Seattle a series of high profile protests with a similar focus took place often mobilizing around the slogan "turn [your city here..] into Seattle." The pattern, appears to be, however, one of diminishing returns. Six months after Seattle, a militant but smaller crowd of protesters against the World Bank gathered in Washington. R&BN endorsed the actions, and noted their success, but also that the state had moved in advance to prevent a repetition of Seattle. 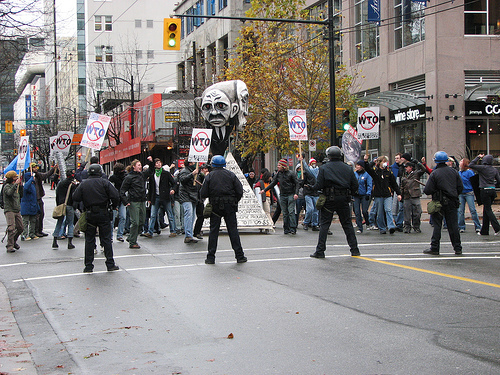 A protest against the Organization of American States in Windsor, Ontario drew several thousand people, but the heavy hand of the state was prepared. The protests against the Republican convention in Philadelphia and the Democratic convention in Los Angeles drew plenty of headlines, and even condemnation of the heavy handed tactics of the LAPD, but the conventions accomplished their business with little difficulty. A partial exception to this trend appears to be Prague, where demonstrators forced the IMF meeting to close a day early. Already in preparation is a "Carnival Against Capitalism" in Quebec City next spring. The capitalist mass media, whose task it is to explain these events within an officially approved framework, has selected ‘anarchism' as the ideology de jour to explain the radicals. Two generations ago the label would have been ‘Marxist-Leninist', but the bloom has rather gone off of that rose; a fact which is deeply troubling to many would be revolutionary parties who have spilt much ink fretting over this matter. The political labels the media or the demonstrators themselves attach are not significant; what is significant, is what those same demonstrators do. Opposition to globalization is what has fueled much the protests, but what is globalization and what does opposition to it mean: British truckers upset over rising petrol costs; a French farmer who attacked a McDonald's restaurant; anti-sweatshop protesters. All of these have at certain times been seen as opposing globalization, yet clearly they are all different (and in some ways the same). Globalization is a fact of capitalist production and has been since capital's inception. While the form of capital's ‘internationalism' has certainly evolved, it is quite erroneous to see globalization as a recent phenomena. The WTO, the IMF and the other institutions of global capital exist because capital likes nominal agreements to control markets. This should not be taken to mean the suppression of competition, rather these organizations exist to protect the interests of the stronger capitalists against the weaker ones. Globalization then, is not a misguided policy by the powerful capitalist nations, who having grown tired of exploiting their own workers, have ventured to remote parts of the globe in search of greater rates of profit. Yet this idea is clearly present in some of the arguments countering sweatshops: Pressure must be put on the Gap or Kathy Lee Gifford to stop exploiting workers . The same idea was present during the divestment campaigns against South Africa in the 1980's; that we can persuade ‘our' capitalists to act in a moral way. This misunderstanding of the nature of globalization, leads into something called anti- capitalism. If capitalism is wage-labour and the production of value, then to be worthy of the name anti-capitalism must be a strategy or strategies which lead to the abolition of these things. Yet, the ever-marginal left bestows the magic label "anti- capitalist" on any movement which passes in front of its eyes. Much of what is called anti-capitalism is in fact only opposition to aspects of capitalism. Many unions oppose aspects of globalization, such as tightening or relaxing of trade polices, because they fear it will have a negative impact on their members' jobs (save "our" jobs? ), or their nation states. This is not anti-capitalism, but defence of national capitalism. Earlier this year on the ‘socialism from below' list, a supporter of the Canadian Trotskyist group Socialist Action boldly asserted that the majority of the members of the social democratic New Democratic Party were anti-capitalist; yet, the NDP has been since its inception, a pro-capitalist reform movement: Anti- capitalism has become a catch-all phrase taken to means any aspect of opposition to a particular capitalist policy. The term has become more or less a bastardized expression in the same way that anti-fascism or anti-racism includes people who are opposed to fascism or racism, but do so from the perspective of defence of the democratic state. Many leftist papers have dusted off the term direct action to describe the anti-globalization movement and actions, and here something must be said about the term direct action. Direct action is a strategy of political action which relies on workers self- action to secure a desired goal. An example might be shutting down an assembly line through a sit-down to protest unsafe working conditions rather than filing a complaint with the union or government safety agency. Both options might produce a safer working area, but the former would not only take a much shorter time, it would build solidarity among those involved in the struggle and also an awareness of the power of collective action. Yet in today's political vocabulary, "direct action" is interpreted to mean any form of action short of marking an ‘X' on a ballot. Throwing a brick through a Starbucks window is certainly a direct action and the thrower of the projectile is making a direct statement against the glass window of the coffee chain; it may even provide the thrower with a flush of adrenaline, but as a strategy it will fail. First of all it is likely to be the action of a minority, which acts as a de-facto vanguard. Second, it breeds no sense of solidarity among the oppressed or a sense of collective strength. Which is not to say, that the solution is organize more people to throw bricks, but that actions ought to build solidarity not promote activism. The professional activist, making ‘sacrifices' for the class has an unfortunately long history on the left. In the US, the main beneficiary of Seattle, at least in the short run, has been Ralph Nader, the Presidential candidate of the Green Party. Actually while it is technically accurate to say Nader is the Green candidate, it is truer to say that the Green Party is running for Ralph Nader rather than the other way around. While some believe that Nader might change the face of class composition in the US or at least have a positive impact on the workers' movement, Nader is quite clear about his role in all of this: He is beating the bushes for Democratic candidates in upcoming elections. The point is not to spit on the, in some cases, extremely courageous actions of those who have engaged in a radical practice by fighting the cops, etc., but simply to see the limitations of that practice. As yet the protests have remained in the streets; but if it should occur, as in France in 1968, that there is an echo in the workplaces, then an anti-capitalism worthy of the name may emerge. First published in Red & Black Notes #12, Fall 2000, this article has been archived on libcom.org from the Red and Black Notes website. Anti-capitalism as an ideology… and as a movement?